MARQUETTE — Many Marquette County women came and volunteered this evening to help rally support for the Democratic Party. Throughout the day volunteers went around town trying to get support for the Democratic Party as the Mid-term elections are just around the corner. Many went from door to door conversations, as well as, made phone calls at the headquarters to get locals informed on Democratic candidates that will be on the ballot. Even Scott Dianda made an appearance at a “women to women” phone bank that is searching out female voters within the county. 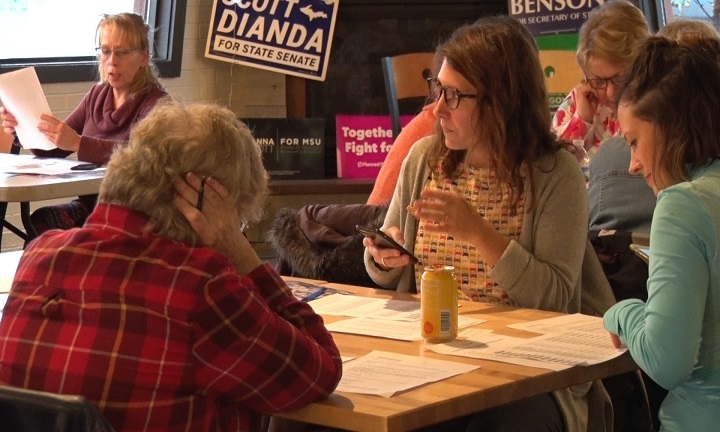 “Women are out now and are saying ‘hey we need to get out and vote,’ and we need to get out and vote for Scott Dianda and all the other people running,” said Democratic Chair for Marquette County, Carolyn Hietamaki. The Midterm election is on November 6th which is only 7 days away. Mid-term election show the winners in U.P.